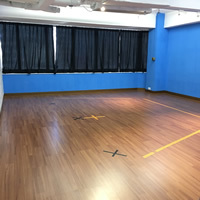 Workshops take place across Hong Kong and Kowloon either at our own studio or at other suitable venues. Faust has its own dedicated venue - the Faust Black Box. This provides an ideal space for our workshops. There is a small stage area and sound system, as well as plenty of space to store our costumes, props and set pieces. The Faust Black Box (as well as our office) is located at 5/F, Nan Dao Commercial Building 359 & 361 Queen’s Road Central, Sheung Wan. For a more detailed map of our location, click here. The Faust Blue Box provides an ideal space for our workshops for children aged 3 to 7. This venue is located at 11/F, Nan Dao Commercial Building 359 & 361 Queen’s Road Central, Sheung Wan. For a more detailed map of our location, click here. In addition we offer workshops across Hong Kong and Kowloon including South Island School (Southside), West Island School (Pok Fu Lam) Hong Kong International School (Repulse Bay), Stanley, Wan Chai, Discovery Bay International School, Alison’s Letterland (Sheung Wan), Beacon Hill School (Kowloon Tong) and American School Hong Kong (Tai Po). We also have school programmes in various schools across Hong Kong, for students attending these schools. Click here to learn more about our school programmes. Information on our current locations is available on the registration page.